Sleepwalking Stories...: Movie Review: Dabangg: More comic book fun please! Movie Review: Dabangg: More comic book fun please! 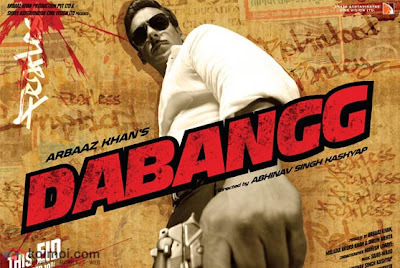 Abhinav Kashyap's Dabangg is a Salman Khan show, a wannabe crowd-puller. There is no pretence made that it is a comic book masala entertainer that will please the mass audience. No morals or cinematic risk here. All tried and tested. Even exhibitionist vulgar at times. So it all boils down to the treatment. There are rare moments of comic inventiveness, the old Hindi film revenge, the invincible hero and the docile heroine. So does it work? Only just about. Chulbul Pandey (Salman) is a corrupt yet fearless cop in small town India. He loves his mother Naini (Dimple Kapadia) but is unable to stand his stepfather Prajapati Pandey (Vinod Khanna) and stepbrother Makhanchan (Arbaaz Khan). His dubious deeds attract the local goon Cheddi Singh (Sonu Sood) who tries to rope him in. On failing to do so, he plots Chulbul's fall by creating a rift between the brothers. The abrupt death of the mother acts as a catalyst to the bitterness. Meanwhile, our crooked cop falls for the hot pottery lady Rajo (Sonakshi Sinha) and tries to make amends to bring the family back together. Not before some delightful over the top action, that includes Salman's flexing vengeful muscles that flings his shirt off, and how a villainous stab doesn't affect him. Dabangg has to its advantage Salman Khan's competent performance, his undeniable gift of screen presence. Sinha makes a confident debut. The show-stealer is certainly Sonu Sood with his enjoyable wicked take on the small-town goon. The razor sharp editing ensures that there are no slack moments. A couple of song picturizations add popcorn fluff of the movie. The same can't be said of the exploitative revenge track, the honest politician track and the lack of groove on the side stories, all sacrificed for Salman's larger than life act. You could also be put off by some of the ribaldry that emanates from the film. Watch it if you want a repeated, light, half-baked Hindi film masala with a slight ting of inventiveness. Sonu Sood aptly exaggerated to Malaika Khan's Munni badnam huvi before Salman arrives on the scene much to the villain's disgust. it seems salman is born to play the character of chulbul pandey..